For more than a year, we've fulfilled our promise to bring the best elements of a startup culture into a company that is anything but. PUMA was founded in 1948, has more than 9,000 employees, and earned nearly $4B in revenue last year. I'd call that pretty well-established. Its web presence, though, was in disarray. Dozens of outdated, Flash-heavy, disconnected sites sat on disparate platforms without shared data sources, marketing focus, or analytics data. It was outdated and inefficient, and it was costing PUMA, big time. Today, with our friends at PUMA led by team head of digital strategy Jay Basnight, we're thrilled to announce the relaunch of puma.com. This relaunch is the culmination of months of collaboration between our teams and reflects a new vision for PUMA's complex digital universe. True to our word, we leveraged what we learned from working with startup clients for more than a decade to help PUMA turn its web presence into the industry leader. Here are a few take-aways. Before we ever read a market study, reviewed analytics data, or discussed a brand strategy, we started with fresh ideas. Without being bogged down by research and metrics, we crafted an initial user experience plan and design concepts based on our gut feel for what would work. Then, in incremental steps, we got it out there and tested our assumptions -- first with PUMA staff, then friends, then the public. With each wider audience, we reviewed detailed analytics -- real data -- to see what was working and what wasn't, and adjusted accordingly. PUMA was considering a big enterprise content management system. We contended that building a custom platform in an open-source framework -- Ruby on Rails -- would provide more flexibility, lower initial costs, and a "just right" fit in terms of functionality and usability for its teams. Since the CMS would need to integrate with systems like its product inventory manager to show real-time product data and run dozens of category and campaign sites in addition to puma.com, extensibility was key. Today, each new PUMA site runs on just such a system. Puma.com saw nearly 1,000,000 visitors last month, making it 10 times as busy as a category site like Running. We didn't start with the big cat, though. Much like a startup starts with a beta and then iterates, we cut our teeth on the Running category site and gained valuable insights into the unique challenges PUMA faced. In fact, we launched more than a dozen category and campaign sites before launching puma.com, and we incorporated lessons from each site into this week's big launch. Execution is Greater Than "Ideas"
We catch a lot of heat from our old-school, "big idea" agency comrades for this; but, we're not afraid to say it: ideas are a dime a dozen. Any good entrepreneur knows that the fields of entrepreneurial regret are full of dead ideas that no one ever had the talent, experience, or guts to execute. Great execution, however, is the shining light of innovation and progress. In working on puma.com, we kicked around a lot of creative concepts, ultimately balancing the unique look PUMA was going for with practical execution of a great user experience, a lightweight and usable interface, and functionality that's actually helpful. With startups, no amount of paid advertising will save a bad product. 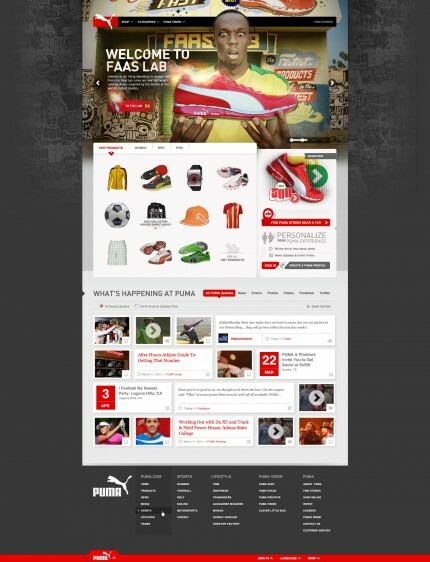 PUMA has great products and, whenever possible, puma.com gets out of the way and lets you experience them. PUMA's not just shoes, though -- it's a sports lifestyle -- so celebrating PUMA's unique brand is important as well. Our approach has led to a significant increase in on-site engagement with the brand: on average, visits to our new category sites have lasted twice as long and involved 90% more pageviews than their old versions. Not only are people spending more time with PUMA, but they're doing it through a forum that truly reflects the brand. At Viget, successful startups are measured by real results: measurable metrics like customers and revenue trump industry buzz and idle chatter. Out of the gate, we're measuring hundreds of performance indicators on puma.com that will show us what's working and what's not -- and, since a web product is never done, we'll continue to improve the site over time. You don't have to be a startup to understand the benefits of working like one. PUMA shows us how a brand that's been well established for generations can reinvent itself online by learning from today's most successful companies new ways to be as innovative as PUMA has always been. Also, check out Owen's post on the Viget Inspire (design) blog about the design process and David's post on the Viget Extend (dev) blog about using Redis.